James Isidore URIDGE married Mary Jane MARTIN in 1890. They had three sons, Douglas James (1893-1972), Edgar John Gibbins URIDGE who died in World War I (1896-1917), and Kingsley Frank G. (1900-1900) who died in infancy. James and William Martin (his brother-in-law) were in partnership and James is listed in the 1891 census as a Miller at Ashley Cottages, Cheriton, Kent. These two photographs were taken at Ashley Mill, on the same day, about the turn of the century. You can see the same group in both photographs. Mary Jane is standing at the back left, together with her sister-in-law Eliza MARTIN née ATTRIDGE who married William MARTIN. The children are Vera MARTIN and her brother Cyril William MARTIN. Information extracted from WATERMILLS & WINDMILLS - A Historical Survey of their Rise, Decline and Fall as Portrayed by those of Kent - by WILLIAM COLES FINCH 1933, kindly provided by Richard Senior. Cheriton, Ashley Mill. * mile NW. of Shorncliffe Station. Brick base remains. Humphrey, the Cranbrook millwright, built this mill, said to have been a small replica of the large Union Mill at Cranbrook. There was exactly the same arrangement of the machinery, except that it worked two pairs of stones instead of three. It was originally built at Hythe, where it was owned by the Horton family. It was purchased by Mr. Brissenden, a builder of Sandgate, who pulled it down and rebuilt it in Tile Kiln Lane, Cheriton, at a cost of £00. A millwright named Spray, of Folkestone, installed the machinery, and it was set to work by a Mr. Gilpin, of Dover, in 1877. Between 1877 and 1889 the mill changed hands five times and was then taken over by Mr. W. Martin, who worked up a good business. By reason of the growth of Cheriton, more general trade was brought to the mill. It had previously been occupied mainly for cattle and poultry grist. Flour was last made at the mill in 1891, the flour dressing machinery then having become obsolete. In 1902 one of the sweeps broke off close to the shaft, when running. The one opposite appeared to be weak, so it was decided to have two new sweeps. Unfortunately the old midling was thought good enough and the new sweeps were duly affixed but it collapsed and a sweep was broken away with it. Thus ended the use of wind power at the mill. A gas engine was then installed, which ran on until 1919, when, by reason of decay, the fine old tower was pulled down and the present brick building erected as a corn store. The square tarred brick base of the old windmill still stands, with the new red brickwork of the tower carried up to almost the height of the original mill. The photograph of this structure as it stands to-day takes in Mr. Geo. E. Ride, a genial Kentish windmiller, who has helped considerably with information about our old mills. For some years prior to 1895 Ashley Mill was worked with two canvas sails and two spring shuttered sweeps but in 1895 all four sweeps were spring shuttered. In the 1830s, two brothers Edgar and Isaac URIDGE owned Cage Green windmill in Kent, and also operated Southborough windmill. 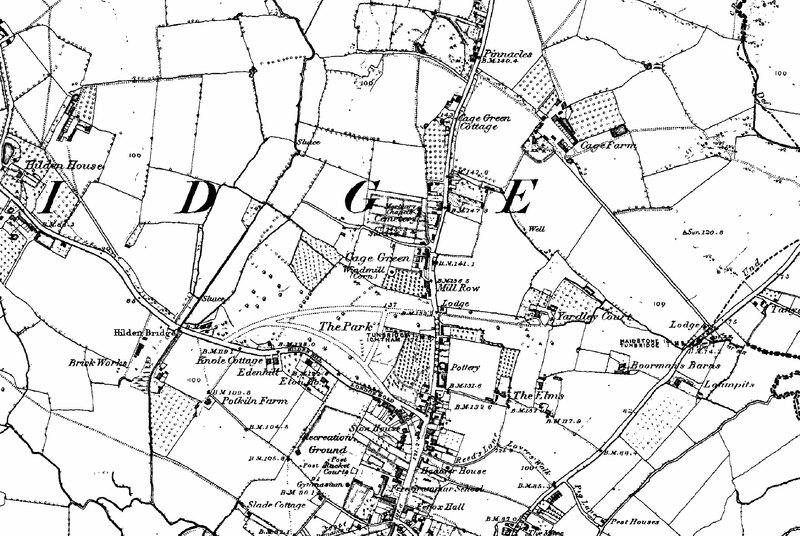 There are no traces of either mill today – except two roads named after the Uridges in Tonbridge (Cage Green). Edgar and Isaac were the grandsons of Isaac and Sarah URIDGE née CRUNDAL. Edgar married, but never had any children, Isaac never married.Edgar married Sarah POTTER on October 30, 1831. He died on April 20, 1853, and in his will he bequeathed property in Cage Green, and Romford in the parish of Pembury. Sarah died December 2, 1853. In her will she bequeathed her estate to her nine brothers and sisters. This mill stood on Southborough Common and must have disappeared over a century ago. Its site to-day is enclosed by a high hedge, used as a garden and called Mill Platt. Uridge's Mill. ½ mile N. of Tonbridge Castle. 1819-43. Uridges Mill was so named after an early owner. Later owners include the names of Cox, Holloway, Ridgeway and Knell (who worked it last.) Bobby Woodman, a dwarf, a well-known local character, worked there for many years. After giving up milling he, accompanied by a white dog, used to go round the town with fruit and vegetables. The local paper published a picture of him a few years ago. Mr. Geo. E. Skinner, of Tonbridge, tells me the mill was pulled down about 1872. The land was required for building. But it was standing in 1868 although it was then no longer in use, for, as a lad, Mr. Skinner often played in it. It stood on a brick base foundation, on which the body of the mill rotated, being pulled round into the wind by a horse. There was a beam attached to the body of the mill, the end coming within a few feet of the ground, to which there was a spread-bat to take the traces from the horse. The mill had a circular hedge round it of a diameter to allow the pole to turn the upper part of the mill on its stump. One of the arms of the mill was blown off on a stormy night some little time before it was demolished. Conversation with another elderly resident, Mr. J. Barton, whose recollections of the mill go back seventy-six years, confirmed its disappearance about 1872, and he gave me the following further information. No. 64 Shipbourne Road, a three-storied house at the corner of Uridge Road, now a greengrocer's shop bearing the name of I. M. Evans (proprietor Herbert Brooker), was originally the miller's home. Close by used to stand some outbuildings used as bakeries, for the miller was also a baker. The site of the mill is to-day occupied by Clifton Villa, a house at the end of Uridge Road, which is a cul-de-sac, ending in a brick wall bounding the grounds of the Tonbridge Nursing Home. There used to be a back lane leading to the mill from Shipbourne Road. This lane to-day is known locally as Back Hill. Actually, part of it is thrown into cottage gardens now but its course can easily be traced. Since writing the above I have received a letter from Mr. John C. Knocker, of the firm of Messrs. Stenning, Knocker & Co., solicitors, of Tonbridge, who writes: I have now in front of me an old conveyance dated in 1870 (when George Lambert purchased some property adjoining Uridge Road) which shows the site of the wind mill on property then belonging to Mrs. Cox, and the site would seem to be Lot 6 of the sale in 1892 after the death of my late partner, Mr. Stenning. The house was then in the occupation of Dann (I believe he was his gardener) and it was sold to V. A. Perkins. I will make some enquiries as to who might have removed the mill, but believe the house was erected a good many years previously to the date when we sold the property.